Review: Let's be honest. Every now and then, and for absolutely incomprehensible reasons, you are wishing yourself back to when action was still plain vanilla. The 80s were the heyday in that respect and therefore, for most part, are also the time "Black and White" orientates itself by. Although you can't really be sure whether it just deliberately makes use of elements of those action movies or is unintentionally using bad clichés. In any case, this makes the Taiwanese blockbuster a flick you will be able to enjoy, but on the other hand it is also a guilty pleasure. Because "Dawn of Justice" certainly isn't good as a movie. The action is simply overreaching, if there really was any kind of threshold the director considered. A whole city is almost leveled, but storywise this is merely motivated at all. This film is actually the sequel to "Black and White: Dawn of the Assault". However, it is also the prequel to the tv show of the same name from 2009. It may be apparent at some points that this is a sequel, but despite some references you don't need to have watched the prequel to understand everything that goes on in the movie - and again, if there really is anything to understand at all. Contrary to the prequel Huang Bo ("Cow", "Lost in Thailand") has only a cameo this time. Instead, Kenny Lin takes over the role of the guy who every now and then drops a few funny lines. 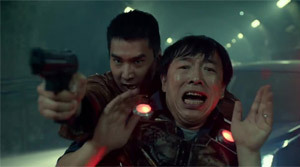 And the movie is desperately in need of that, because Mark Chao ("Monga") as the story's hero is just about as likable as a block of cement and has exactly the same acting range, too. It also doesn't help that the rest of the cast doesn't deliver any kind of excellent perfomance either. Still, before I continue criticizing it has to be pointed out that the acting achievements aren't nearly as bad as you might be used to see in other B movies. There is never a moment when the acting becomes unintentionally funny. Yet, the characters are uninspired to the degree that you often will find yourself rolling your eyes. This becomes especially apparent concerning the supporting characters. Unfortunately, the villain, played by the director himself(! ), is everything but convincing when it comes to what drives him. Obviously, there was taken a page out of Joker's book from "The Dark Knight", but despite his personal background story the chaos and new beginning Lan wants to initiate aren't motivated by a reasonable plot. The fact that Christopher Nolans's Batman trilogy has been made excessive use of also becomes apparent in the story detail that the city is cut off completely from the rest of the world. It's impossible to list everything that's thrown into the story mishmash and after all it also isn't of any importance. EMP bomb, deadly virus, collapsing skyscrapers, that's about a few of the most imporant key words. There may be a few people who feel offended watching airplanes falling from the sky and crashing right into skyscrapers, but that's just what happens when you detonate an EMP bomb! However, aside from the obvious parts the screenplay isn't entirely daft. There are a few interesting reasons for the actions of some individuals, but since the story is absolutely overreaching in its attempt to be epic you can't take anything serious. Furthermore, as already stated, the screenplay is a mess. But the pacing is good, just the way it should be. There is no room for a breather. The stylish directing is appealing, too. Additionally, the technical gimmicks and the sparkling skyscrapers create the impression of events taking place a few years in the future. And yet there is this undeniable 80s feeling surrounding the movie. The same goes for some of the neat fights, particularly the one in a nightly scene between containers at the harbour which gives the combat a modern look thanks to the use of slow and fast motion sequences without lacking the blunt flair of old school skirmishes. The same goes for the sets and special effects. Despite the involvement of BUF, which has already worked on "Thor", it becomes apparent that the budget was limited and the director bit off more than he could chew. Because not all special effects look convincing. But some of the explosions and sets are genuine handiwork and thus nice to look at. In the end, "Black and White: The Dawn of Justice" is a complete mess of a blockbuster, though. One of those films you can't recommend because they aren't good, but which nonetheless are somewhat of a fun ride.